San Diego, California, has a problem with spiders. These aren’t the cute David Bowie kind or the useful silk-making kind, these are the invasive, super-poisonous kind. Originally from South Africa, the brown widow spider, also called the gray widow, brown button spider, or the geometric button spider has spread like wildfire throughout the United States and has recently found the city of San Diego to their liking. Not only are they running the local spider population out of town, they’re also pretty much running everything and everyone out of town as their population swells out of control. 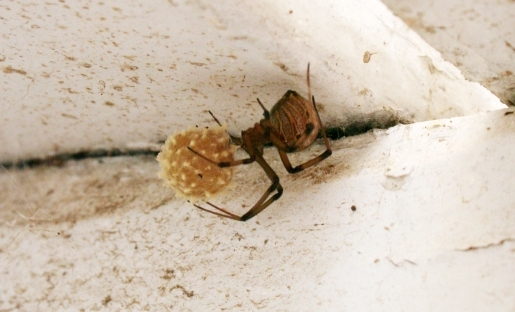 While the brown widow isn’t aggressive, its bite is reportedly more poisonous than its cousin the black widow and each brown widow egg contains up to 35 spiders, making it significantly more dangerous just due to sheer numbers. Basically, it’s the plot of the movie Arachnophobia come to life: spiders come over from Africa, have no natural predators in the US, they lay thousands of eggs, they’re super poisonous, and they take over an entire California town. Now it’s up to Delbert McClintock to save us!